The 1886 Winchester was a successor to the 1873 Winchester rifle, and had one of the strongest and finest actions of any lever-action centerfire rifle that Winchester ever produced. It was designed originally by John H. Browning (his Patent), for the more powerful cartridges that had come into use in the late19th Century. The 1886 Winchester was offered in a number of calibers, including .45-70 Government, 50-10 Express, .45-90 WCF, .40-70 WCF, .40-82 WCF, .38-70 WCF, .40-65 WCF, .50-100.450, .38-56 WCF, and .33 WCF. The most popular caliber was the .45-70 Government. The 1886 rifle was available in several different Models, the Sporting Rifle, Carbine and Musket. From 1886 through 1935, there were a little less than 160,000 of these rifles produced by the Winchester factory. The 1886 was also chambered for numerous smaller caliber cartridges of the day (e.g., 33 WCF) and the value of a rifle is greatly influenced by caliber, with the larger calibers worth considerably more. 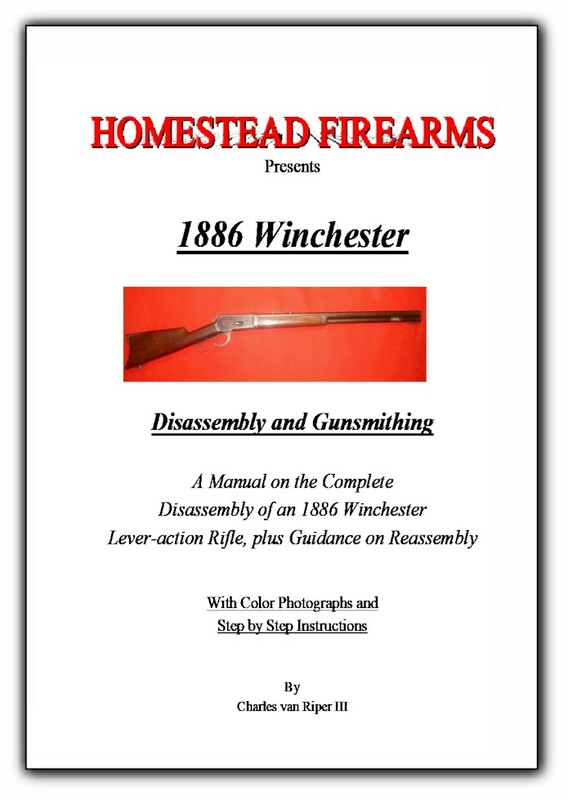 This book will easily guide you through the disassembly process of all the types of 1886 Winchester Rifles.